Mental well-being is fundamental for enjoying healthy lives and building harmonious societies, yet cultural stigma and socioeconomic factors often undermine access to mental health care. The World Health Organization (WHO) estimates that despite being a major cause of disability, mental illness is not treated in up to 50% of cases in developed countries and in up to 85% of cases in developing nations. The Centers for Disease Control (CDC) has reported that half of all adults in the Unites States will suffer from at least one mental illness during their lifetime. 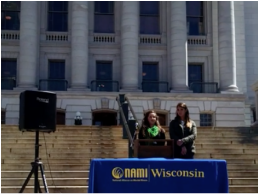 The mission at NAMI-UW is to fight the stigma against mental illness by educating ourselves and the public, advocating for the rights of people with mental illness, and supporting our fellow students on matters of mental health. We primarily serve the student community at the University of Wisconsin, but also strive to expand our work to neighboring communities and internationally. Please explore our website to find out how you can get involved with NAMI-UW! 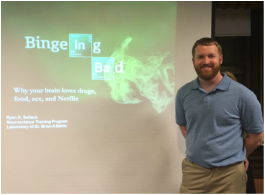 Guest speakers, workshops, and outreach events cover a wealth of knowledge on mental health topics, ranging from relaxation techniques to the inner workings of the brain. 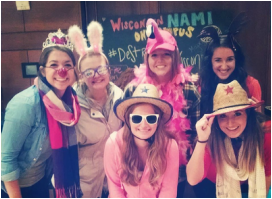 Social events among NAMI-UW members and our campus facilitate mental well-being, build relationships among like-minded individuals and provide a stress-free environment for fun and growth!